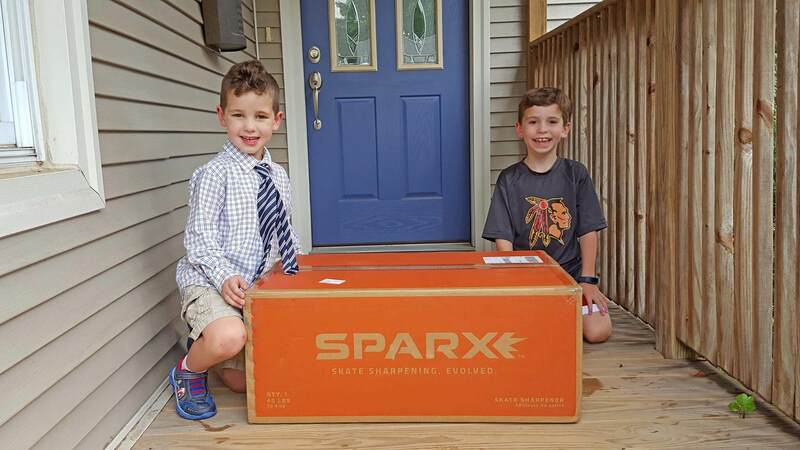 I was one of the early owners of the Sparx Skate Sharpener, having ordered back in January of 2016, and took delivery in August of the same year. At the time, the wait seemed to take forever but, now, two years into ownership, I must say that this has been one of my very BEST (though also probably most expensive) hockey related purchases. We have 5 skaters in the house. 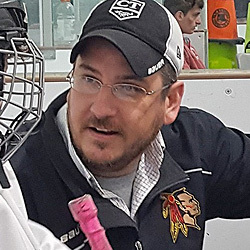 My wife and I are occasional skaters at public skate, my 9 year old plays hockey at an elite level, my 7-year old is well on his way following his older brother's path, and my 3-year old is just getting started out on the ice. Having so many skaters made the purchase a no-brainer. So, in our house, nearly all of the sharpenings are on the kids skates and, frankly, I have no idea how great their edges are since, well, I'm not sure my kids even know what dull skates feel like. Pretty rough problem to have, eh? On a brand new pair of skates, right out of the box, I found that I had to do roughly 12 passes on each skate to get them sharpened. 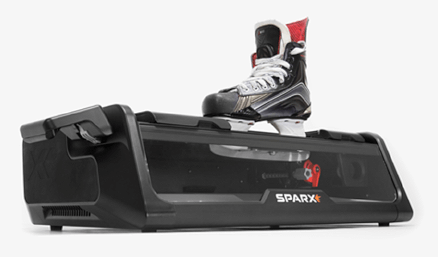 The Sparx documentation lists 10 but, for me anyway, the extra two passes are what made them feel like all of the other skates in the household. One downside that some folks in my circle have pointed out is that the Sparx machine can't give you a custom radius so, if you're into that sort of thing, you'll still need to visit a professional skate sharpener to get you started. We're not a family to reset the profile of our skates -- usually called the "radius" in skate sharpening circles -- so it's not an issue for us at all. For those that don't know the term, when you buy new skates, the ends of the blades are kind of squared off. I mean, there's still a rounded corner but it's pretty square. Some players prefer to have those edges ground off making their blade look more like a banana coming off of the plastic steel holder. The result -- provided the person who grinds off the front and back of the blade did it correctly -- is that there is less of the blade touching the ice at any given time. More agility at the expense of stability is the idea. If you, and your sharpener, really know what you're doing, the blade can be contoured to force you to lean more forward or backward on the skate as well but that requires heavy customization and, frankly, most skate sharpeners are just going to ruin your blade or you'll get accustomed to something that can never be replicated. If you look closely at professional players' skates, you'll notice it's a little like tongue-in or tongue-out on the skates where the more popular variation wavers from season to season. Professional players use both styles. Side note, when I was a kid, I would not have been caught dead wearing a bubble or with non-leather gloves. On my son's teams today -- a majority wear bubbles and every single kid wears that synthetic nylon-like glove material. Point is, styles change...and it's a style thing. I'm just waiting for corduroy team jackets to make a comeback. Just wait. It'll happen. One teammate of ours, who'd been skating on banana profiled blades since learning to skate, had trouble wearing a new pair of skates that hadn't had the "corners" ground off yet. His main issue was that the front corner was catching the ice on the front like a figure skaters toe pick might. Certainly frustrating. At the same time, he would have gotten used to it in short order and it may have even improved his stride by forcing him to lift his feet more than shuffle them. In the end though, it's little more than a preference thing and all what you get used to. At the youth level -- the benefits of a custom radius are negligible, if they exist at all, and probably not worth the trouble, anyway. All that said, even if you can't utilize a Sparx machine with a brand new pair of skates, straight outta the box, you can still use the Sparx for all of your follow-up sharpening once someone custom grinds the steel on the skates down to your preferred profile. So, usually, I do a couple of passes on my kids skates every other week or so unless I notice a nick in the blade and this has been pretty successful for us. 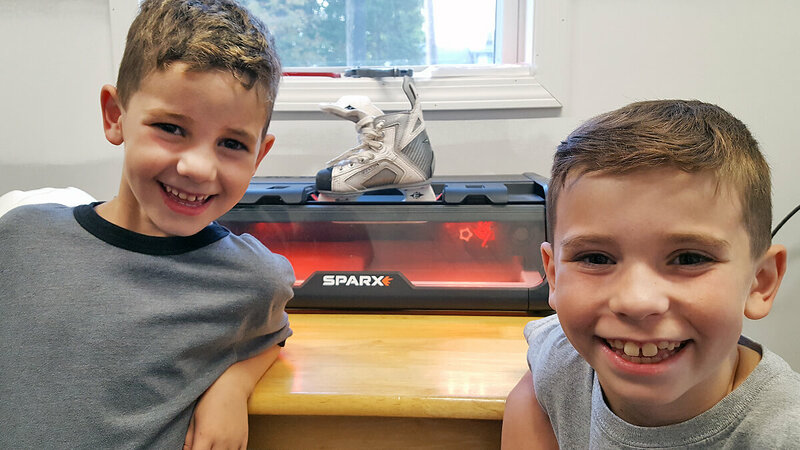 It lengthens the life of the Sparx grinding ring (since we're using so few passes) and ensures my kids skates are never, ever, dull since we're sharpening all of the time. It took over a year and a half for our first grinding ring to "run out"...which is a good thing. Everyone I talk to that says "No way, too expensive" is looking at it as if it'll take over 100 sharpenings (or whatever your number is) to justify the investment. That's far too simplistic -- think of all of the rinks you've been to that don't have a sharpening service? Think of all the times you don't have enough cash on hand? Or when you get there and see dozens of skates ahead of you in the queue. Think of all the times, especially in my neck of the woods, that you make a trip out to the pro shop only to find they're not open for some unknown reason. Ugh!? Or maybe the "dude" that actually knows what he's doing isn't there when you need him to be. All of those circumstances evaporate when you have a Sparx sharpener. Two minutes, at home, anytime you want, and you have sharp skates. Done. I'm not certain that ours has actually paid for itself yet, strictly by the numbers, but in my mind, it definitely has. My kids haven't had dull blades for a single skate in almost two years and I've never once had to run out, unexpected, looking for a sharpen. If you're on the fence, just check out some of the reviews and/or videos on YouTube. I was going to make a video here but it's really been done much better than I could do it already. But really, even though the price has jumped a couple times since I made my purchase, it's still a great value.